I am a lucky person. Why? Because I was lucky enough to be born into a country that values workers’ rights. As a hospital nurse, I take for granted that my enormous hospital has multiple fire extinguishers, fire doors, fire prevention protocols and policies that keep both people and structure from igniting. Were Americans always so lucky? The industrial revolution hit our cities hard, and the influx of fresh immigrants meant that labor was both cheap and easily replaceable. Complain about your working conditions? Well there were many others who would be happy to take your job, so keep your mouth shut or get fired was pretty much the policy around the turn of the last century. 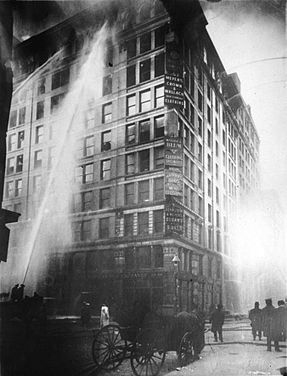 The New York City 1911 Triangle Shirtwaist Factory fire was a wake up call to America industry, and it allowed for the union movement to start bringing safe and reasonable working conditions to our workers. Child labor, unending work hours, locked work spaces and other blatantly unsafe working conditions finally got the scrutiny they deserved. It wasn’t immediate or easy, but unions brought safe workplaces to America. American manufacturers, now saddled with the cost of paying working wages built overseas factories in countries that did not require the same workplace safety measures. Where cheap unending labor was once again easy to find and where abject poverty was the norm. I wrote in 2010 about a factory fire in Bangladesh that killed a least a hundred people, where most deaths were attributed to workers jumping from upper story windows because a gate to the stairwell was locked. Read that again, the stairwell was locked. This garment factory was producing clothing for Gap, JCPenney, H & M and Wal Mart. 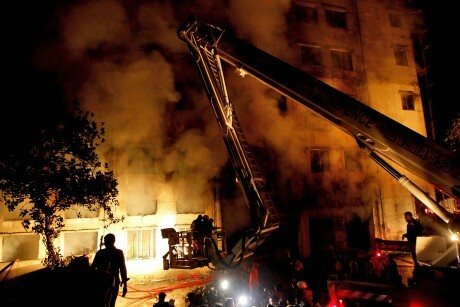 And now the story of another Bangladeshi garment factory fire has hit the news. I like a bargain as much as the next person, probably more. But there is a cost, a human cost to all those super cheap deals. I will not be taking advantage of all the awesomely cheap consumer goods to support my holiday shopping this year. Join me and buy used, buy American, buy local, buy from manufacturers who certify their safe labor practices. And keep those poor workers and their families in your thoughts. They are just as deserving of safe working conditions as you and I. Over the last five years I have gone from buying new clothes to only buying new underwear/undergarments and socks. Now even used shoes. Everything else I bought this year was pre-owned. A side benefit aside from the human and environmental benefits is the financial one. I was going to run to the store and get mittens for my boys tomorrow. Instead, I looked up a tutorial. I only found a few thousand tutorials on how to make fleece mittens. I have a sewing machine and I even have some scraps of fleece. I’m inspired. Thank you as always for making me think twice. I need to go back to making my own clothes. We buy second hand for almost everything. We’ve even asked for our family members to purchase us second hand goods if they are going to buy us gifts for some reason. This is not an idea that they embrace wholeheartedly, but some of our family has started to adopt this for us over the years which we really do appreciate. So…how do you handle folks that do not appreciate getting second hand gifts from you? I always feel a little bad when someone gets us something crazy expensive and we’ve given them what we consider a great thrift/second hand find. No one has ever admitted to me that they care about secondhand gifts. Of course, I find great stuff used, so the gifts are often more “expensive” that we would have been able to initially purchase from a regular store. Thanks. We have definitely gotten looks, but just like you mentioned…the things we find and give are really nice and often more “expensive” than what we could buy new. You shouldn’t feel bad about your gift-giving style, and shame on anyone who tries to make you feel bad for following your conscience. They should consider themselves lucky that you thought enough about them to give a gift. Anyone who cares more about the size/cost/newness of the gift than the kindness of the giver quite frankly doesn’t deserve it! That being said, I know a few people like that myself. For them I will usually try to give something that can’t be bought such as my time helping them with a difficult chore or project, or make them something I know they love and can’t easily get anywhere else. Another option can be to make a donation in their honor to a cause they support. If all else fails, then you may want to suggest ending the gift exchange and just spend time together doing something fun instead. My sister in law has some kind of allergy to anything second hand. We usually just give her and her husband some wine. Other options would be homemade food, a houseplant (you can probably sneak it into a second-hand pot without them noticing), a magazine subscription, tickets to something, or a restaurant gift certificate – depending on what they like and how much you want to spend, of course. I converted a friend this weekend who previously insisted on only buying new. We stopped by the consignment store and got a name brand cardigan for her, with tags, for a whopping $10. Then we walked to the thrift store and found her a pile of nice t shirts, a board game she’s been wanting (with all the pieces) and Christmas decorations, all for $1 apiece. Katy, thanks for a very thought provoking, well-written article. 1. If you buy used (I almost exclusively buy used for myself and my children, holla 50% off Goodwill day!! ), from the above companies (Gap, JC Penney, H&M) you used as examples, aren’t you still in essence supporting offshore labor? I wanted to ask the same thing. Other than the tag, where do we begin to know who uses safe practices? I will google and begin my research but if you have any hints that would help, they would be much appreciated. Agree with Andrea! What an eye opener….very sobering! Will be awaiting any info that will help find things made in USA and even the used items….but once they are already brought into our country and donated….we aren’t contributing by buying more new items that were made in sweatshops. My husband works for one of the largest textile companies in the world …. Milliken and Company based here in Spartanburg, South Carolina (www.milliken.com) His specialty is Outdoor Adventure Wear and he has produced fabrics for labels such as Patagonia, Nike, and UnderArmor but is currently designing fabrics for the military. To find and support American textiles, look for the “Made in the USA” tag or description. Be willing to pay more for better quality and know that you are putting people to work right here in our country when you buy USA. Protest when big name companies insist they can’t find what they need here… such as when Ralph Lauren designed and made the USA Olympic athletes clothing overseas. Believe me, Milliken and Company has made many Olympic fabrics and would loved to have had that business but it was only because of cheap labor that it was taken overseas and you can see by Katy’s article, why the labor was so cheap. Believe me, lots of companies DO use American made fabrics and they are quite pleased with the results. Although I also support second hand shopping, sometimes buying local and speaking with your dollars makes a huge difference in the lives of us and our neighbors. Thank you so much for sharing this information. I was disgusted with Ralph Lauren during the Olympics. Of course, I don’t think I’ve ever bought anything from him in the first place. Katy, I applaud your efforts and I, too, buy used wherever possible. I do want to point out that the fires (at least some) were arson AND that these are good jobs for these people and without them they could not feed their families. Not buying these products is going to put them out of a job. I do NOT promote unsafe working conditions of any kind in any place. Understanding what it takes to make changes is important. I have studied history and in every country that we consider a leader today (including the US) there has to have been “sweat equity” to make it work, to build hte needed capital. And yes, that does come at a price. Not one I like, condone nor of which I approve but it is a fact. I don’t buy clothes from sweatshops IF I know and can help it. I think you make this issue VERY simple and it is complicated. I appreciate your concern but I read your blog on how to save money, be frugal. I don’t read it for social commentary or to be told what to support. John makes a very good point. Many times, American manufacturers located over seas offer the best jobs available in third world countries. People employed in these factories generally make much better wages than their otherwise-employed neighbors. Should American companies strive to maintain the same health and safety standards that are required here in the states? Of course. But I wouldn’t require that at the cost of thousands of jobs for people who wouldn’t otherwise be able to feed their families. The leadership in countries where American manufacturers have factories will need to change their opinion of the working class in their country before major change is made. The MNC’s look for the cheapest product suppliers and are only interested in the bottom line. It is not just about cheap labor it’s about reducing the total labor cost component to the unit price of each item. No health insurance, sick leave, vacation leave, fire extinguishers, poor lighting, etc. If one factory gets to expensive move production to a cheaper one. It is management at its laziest. Outsource all production and let the suppliers fight tooth and nail to be allowed to produce goods for Gap, JC Penney, Wal-Mart, etc. And when something goes wrong blame the suppliers, propose a code of conduct, or schooling for the child workforce to placate the NGO’s, and when the cameras have moved on its back to business as usual. Well, you don’t have to read it at all if you don’t want to, do you? Thank you for this post! Unlike most of your commenters, I’m a very typical American consumer who spent a good part of my day yesterday on cyber Monday. But blogs like yours inspire me. I would like to buy more American made products and support my community, but I feel like it’s very difficult to find said items, I don’t even know where to start! I agree wholeheartedly with you. I will say that while it is very difficult to find American made products. It’s American companies CEO’s that are to blame. The great recession has made unemployment rampant it this country. I would gladly pay a few dollars more for American made socks and undies. Why not employ our own people in the many abandoned factories. Greed is why the economy gets into so much trouble, CEO’s who want massive salaries while paying pennies to third world workers and materialistic shoppers who want to grab as much as they can as cheaply as possible. Thank you for bringing this to light and I don’t believe you are suggesting a simple fix to a complex problem as someone said. We are all to blame if we are honest. Lets stop our complicity with greedy corporations. A positive result of the skyrocketing oil/fuel costs has been increasingly more manufacturers’ bringing their production back to the U.S., as (1) transportation costs can outweigh their savings from cheap letter (2) apparently — and I was a little surprised to read this — American workers are noticeably more productive than those in overseas sweatshops, so it takes fewer man hours here (although at a much higher hourly rate) to make the same goods. Whether the manufacturing jobs come back to union states or non-union states doesn’t matter to me — I love that when I NEED to buy something, I have been finding increasingly more options for buying American-made! I recently stumbled across a trendy women’s clothing independent boutique where 100% of the merchandise was made in the USA, and it wasn’t any more expensive than other boutiques’ merchandise (on the same street) that was not American made. I am right there with you… I always knew these kinds of cheap, almost disposable clothes were made in reprehensible conditions. It is the same reason I have never bought from Ikea. really glad you brought this up – I put it on my Facebook page as I don’t think many in this country were aware of it, and I too thought of the triangle shirtwaist factory fire. The factory in Bangladesh produced clothes for walmart brands (I don’t know if some or all), Tommy Hilfiger, and Gap. I was hoping to at least raise this issue in people’s consciousness. Way to go, buy used! Katy – thank you so much for posting this. A worthy organization that works to improve conditions in overseas factories is the International Labor Rights Forum. http://www.laborrights.org. They have an article about the fire and about efforts being make to improve conditions in Bangladesh. ” In March 2012, PVH Corp. (owner of Tommy Hilfiger, Calvin Klein, Van Heusen, IZOD, ARROW, G.H. Bass, and Eagle) signed an agreement with Bangladeshi unions, international unions, ILRF and other labor rights groups to develop a fire safety program to prevent future deaths in Bangladeshâ€™s garment industry.” Other brands have been invited to join, but have not yet done so. Again, thanks for posting this. I read your blog not just for the frugal tips, but also because of your humane and sensible outlook. Sorry, but the comments bring this out in me. CEO’s are not after massive salaries when the send jobs overseas. They are repsonding to CONSUMERS that want the same goods at the same quality at a LOWER price. Jobs went overseas because it costs too much to make here compared to what Americans will pay. Not more, no less. Many of the jobs that went overseas did so because UNIONS and Workers would NOT work for those low wages. It is simple economics. Seriously, look around at the minimum wage jobs here that go unfilled and them imagine the jobs that are paying LESS overseas to do even MORE work. Folks, America has priced itself out of jobs. Katy, I love goodwill, thrift and consignment shops. Stopping waste and saving money is both fun and common sense. Keep up the posts. I actually believe it’s due more to stockholders who want profits, profits, profits. Profit maximization is the goal of every company (much like your goal is to maximize your lack of buying new). Profit is NOT a bad word. The market, aka the people who buy, are the ones that decide what is produced. Period. In any free market there is going to be pressure on price, which we all agree is good. For example, if there was only one thrift store the prices would be higher for used goods. I find the idea that profit is bad interesting. You want to keep all your money, which is in effect making a profit on what you DON’T pay for something but you don’t see that as bad. We should not vilify the companies but look to the people who buy the product as the source. They demand it and the company will supply it. Really, it is simple economics. thanks for this- i’ve defintely thought about this before, but am really not sure where to start in buying US made items (specifically clothes) or from manufacturers abroad who do have good working conditions. any tips or a post on ethical brands would be awesome. thanks! A friend once pointed out that you go to the cheap stores (Walmart, Kmart and such) and all the clothes are made overseas in third world countries. Then you go to the high end stores (Macy’s, Nordstrom and such) and all the clothes are still made overseas in third world countries! Buy used, at least the money goes to a good cause! I think it’s great to buy used. If you want to buy something new, or live in an area like I do without thrift stores, I’ve found many small boutiques sell American-made clothes and other items, or at least “Made in Italy”, “Made in Germany” i.e. other countries with safe practices. Sometimes the items are a little more expensive, but the quality is 100 times better, so overall I find it to be a cost savings if you just buy fewer items and wear them a lot. Great Post Katy! No “good deal” is worth anyone’s life. Hopefully the more people who know about these travesties will stop and think about there purchase and what the company they are supporting condones. Another idea is to support artists and crafsman in your area.While it’s not always the thriftiest solution, we often try to give something unique and unavailable in corporate malls. At the same time I know that the profits are staying in the community. Great addition, I should have included this to begin with. Amazingly, I have found 2 products made in the USA recently….New Balance sneakers at DSW, with a tag announcing made in USA and wine glasses at Dollar Tree. I was shocked to remove the sticker from the glasses a see the made in USA label. Since I don’t frequent thrift stores any longer and rarely buy anything, I find myself now looking at labels much, much more. I live near a New Balance store. The majority of their shoes are made in the USA, a fact they advertise proudly on their store window. They are also closed on Sundays; I think it’s kind of nice to guarantee their workers a regular day off they can count on. You might as well write “don’t buy electronics.” I have waited for years for the cash to buy the two pieces of electronic equipment I needed. For the rest, I am baking gifts for the business people I deal with on a regular basis, and re-using clean/sterilized containers that I have already paid for. Katy, would you mind if we all started sharing where we find a great American made item? That may help others find the USA produced items that they are seeking. I found boys’ athletic socks at Target that were made in the USA. Also, Lolly Wolly Doodle is a Facebook based company that makes boutique style children’s clothing in North Carolina. Sometimes these American made products may be a bit more expensive, but I had rather have a few nicer items than a closet full of cheaper garments. That’s a great idea. 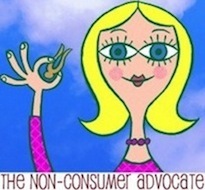 What if you shared that information over at The Non-Consumer Advocate Facebook group? Ok! Sounds good. I will share my American made finds on the FB page and hope others do as well. I really try to buy products made here, but I get so frustrated by the unions who have demanded so much from American manufacturers (mostly auto related) in our area that they’ve closed. There has to be a happy medium between the unions and manufacturers so that everyone works together. Also, did you see the news story about some of the companies in China who make cell phones having fencing around the tops of buildings because so many workers were commiting suicide at work because of the intense pressure? Sad. get rid of something that’s been around since the beginning of time. I agree that changes are the cause of what we see today. When I was growing up (in an upper middle class family)in the late 1950s, we only had two pairs of shoes: one for church and one for school. I may have had one “good” dress and an outfit for each day of the week of school…. even through my teen years until I began to babysit and make money for more clothes. I still don’t buy many more clothes that this. Likewise, our Christmas was ONE gift. I well remember the year I got a bicycle with a cowboy hat hanging on the handlebars because that meant Santa brought me TWO things. When did we become so crazy about shopping and consuming? I guess it was the ’80s – and it came from advertisers and businesses making us think we “needed” stuff. WalMart was a big contributor by bringing cheap prices to all of us until we demanded that everything be cheaper. That was when small business started to fail because they couldn’t match the prices of WalMart. And all of a sudden there is a glut of JUNK in the marketplace. There used to be a time (in the past 30 years) when the drug store chains like Walgreens, CVS, and Rite Aid actually sold drugs and medical items instead of 99% Chinese imports. Why people go there to buy all that junk is beyond me. Yes, the internet has made us a smaller world so there is going to be global collaboration in manufacturing. Just remember that there ARE still textile mills in America and builders of automobiles and manufacturers of other items. I guess if we all try to make informed and thoughtful decisions about our buying we can make a difference in our own home and community. I think your point is very well taken. Buying used doesn’t really solve problems, in the grand scale of things – and yes, that can be frustrating. I know what you mean. However, I do think that it’s good to avoid being an active part of the problem as much as possible. When you buy most of your stuff used, you’re sort of living off the “waste” of the system, so you aren’t encouraging bad practices as directly. We all need to buy some stuff – and by choosing to either buy used or buy stuff that comes from better labor practices, at least you’re opting out of making a direct contribution to the worst of the problem – which may be all any of us can do. So glad to see this post. For the past year I have bought almost everything “made in the USA”. It has been a challenge but a very interesting one. Men’s underwear was the hardest to find, my poor 14 year old literally wore “mended” underwear until last month when I found Flint and Tinder a new store that only makes men’s undergarments in the good ol USA. I will admit some things you just have to pass on and do without (like junky plastic toys) but for most items you can find a wonderful product made right here. It takes a bit more work and planning but I have found the more time and effort you put into purchasing a product the more committed you are to quality and less likely to over consume. The one item I have yet to find made in USA is a baby doll, I have been able to find rag dolls but not the ones that look like a real baby which is a request from my 5 year old. So if there are any entrepreneurs out there who know how to make a baby doll – you would make a fortune! There is a better alternative from buying new and used and that is: exchange! Yep, clothing exchanges are fantastic. You bring your clothes that you don’t want anymore and so do a few others of your friends and you pick and take home what you want and decide what to do with the rest: donate to a thrift store, a homeless shelter, a women’s shelter or who knows. There are many ways to run an clothing exchange or swap (it doesn’t have to be a one-for-one but it can be) and you can do that with your friends or with a larger group (your church? neighbours? etc.) There are lots of swap groups through meetup.com so you can check if there is one in your city. You bring your clothes that you don’t want anymore and so do a few others of your friends and you pick and take home what you want and decide what to do with the rest: donate to a thrift store, a homeless shelter, a women’s shelter or who knows. There are many ways to run an clothing exchange or swap (it doesn’t have to be a one-for-one but it can be) and you can do that with your friends or with a larger group (your church? neighbours? etc.) There are lots of swap groups through meetup.com so you can check if there is one in your city. Or just invite your friends over. YES! I have a long list of reasons why I don’t buy new clothes except necessities. This human cost is my top reasons, yet it is so hard for other people to understand. I will share your words with my family and friends – sometimes it helps to hear it from someone else. And hopefully I’ll be getting hand made and hand me downs for Hanukah! Thanks, Katy! This is the sort of thing I try to cover in my blog as to why we try to purchase used or ethically made goods. If we can’t get what we need from either category we try to buy as good quality as possible so we don’t need to replace it in a hurry. Right now I am wearing an “American Rag” short sleeved collar shirt Made in Bangledesh, “Levi’s” jeans Made in Cambodia, and “Puma” sneakers Made in China. My work uniform: pants, shirt, and jacket are all Made in China. I checked all the tags on all my clothes. Not 1 item is made in the U.S. Shocking but unavoidable unless you buy from secondhand stores buying clothes made in the 80’s or 90’s. I’ve been practicing a buy used or buy US made for the past few weeks. It has made a huge difference in cutting unnecessary spending. It’s not too hard but finding small practical things like Clothes Hangers Is really tough.